We have customer who is seeking information on the type of data that is shipped in 'call home' events to Dell EMC support via SRS. From the SRS customer presentation, it states SRS transmit system-generated, encrypted alerts and configuration files back to Dell EMC support. Customer wants a sample of these files or logs for review by their security groups. 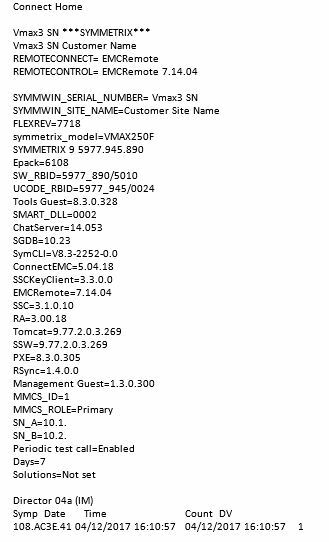 Are we allowed to share these logs with this customer provided we remove the SN, customer name or any other info that may identify the product or customer? Below is a sample of edited dial home logs. I don't see sensitive information for me you can share with customer.